As a child raised in a Christian home I was accustomed to hearing a fair amount of ‘Christianese’, the word I use to describe the peculiar English dialect that Christians often adopt. For instance, ‘Brother’ does not mean sibling, it means, “I can’t remember your name but I want to be your pal”. Outreach is one of those sorts of words and usually means a mercy mission to the slums or a neglected old age home. I use the word differently. Outreach, to me, is a mind-set that is central to the Christian message. It signifies an outward life orientation. We are called to live lives characterized by giving – and giving is outwards, from us to others. It is so frustrating and sad to see how much of today’s church emphasis is on getting instead of giving. Get rich, get health, get success, and so on. And when giving is taught, it is so often in the context of getting – Sow in order to reap, sort of stuff. Outreach is not natural to us; it is something that we adopt as part of our life in Christ. For example, try this little experiment. Ask half a dozen people to join hands and form a circle. Then watch what they do. They will arrange themselves in a circle facing inwards and then grab each other’s hands. I have done this on a number of occasions and never have I seen people form a circle facing outwards! It just doesn’t come naturally. 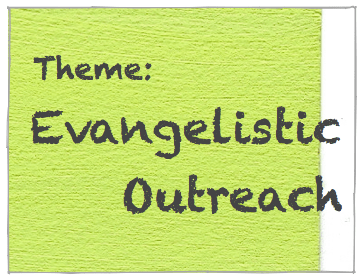 Outreach includes charity, ministry, social concern, and evangelism but it is more an attitude and orientation than it is a group of activities. When we are born again we are turned inside out and our life orientation shifts from inwards to outwards. And it is because of this outward orientation that we give our money, our time, our talents… and the Gospel. I am getting it from all sides that God loves the poor, the widows and the orphans. Here is a link were Bono talks to Bill Hybels that I think is really good (http://www.youtube.com/watch?v=grBByc7t3Fs) and is worth listening to. I am starting to believe that I will be at my happiest if I am actively participating in helping people in need, but not because it is a Christian duty, but because it is good for my soul.